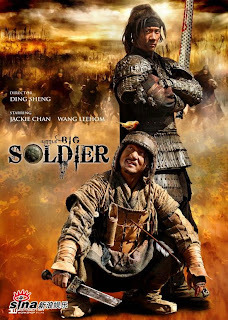 Little Big Soldier aka 大兵小将 (read: Da Bing Xiao Jiang), highly recommended movie. Seriously, better don't miss this one. Love it so much. The story is simple but original, its about an infantry, the little soldier, from Liang cast by Jacky Chan, taking a big general of Wei, cast by Lee Hom, as a hostage to his country to exchange it with some land so the little soldier could retired, stay and build his farm. At first, the soldier was totally a loser look type. Hiding, pretends already death and running away from the battle field. And, the worse is, he take advantage from others fight, the general was tide when he fainted and injured. But, the character revealed after that. There are reasons why the soldier done those loser acts. On the way, there were several time where they have to stop fighting, then cooperate. The general was pursued by his internal enemy, another army of Wei. And, they also have to run from the sadist nomads and bear. Well, they done it on Jacky's way which is entertaining. For me, its been a while since the last time where i really enjoyed Jacky Chan's movie. Its funny, natural, and touching. Spy Next Door was great, but this Little Big Soldier is a wow! !, super great! Shinjuku Incident is nothing compare to it. Say no to those Shinjuku's sadist and bloody scene! Wekkss.. I watched this lovely movie with my sis and mom. It was great spending time together like that. Well, its a kind a new activity for us, and since mom seems like it, i think we should do this more often or just make it as our new habit.